Spacious, Comfortable 2 Bedrooms Lounge Room Balcony New Kitchen And Bathroom. Professionally managed and maintained, we pride ourselves in providing excellent customer service to our guests, prompt communication and flexibility. Cleanliness is a priority. PARKING ON STREET IN FRONT OR IN A NEARBY SECURE PARKING STATION. In a peaceful residential area but still walking distance to most major sights including Old town etc...Prague monuments and the river itself with its vintage ferries. Spacious and comfortable, 3.6 meter tall ceilings, recently renovated maintaining all original features such as parquetry flooring throughout, massive chandelier-lit grand entry foyer. Decorated with art deco antiques. 2 large bedrooms, spacious living room with 2 fold out sofas. Brand new fully equipped independent kitchen, new bathroom with tub and overtub rain shower, separate toilet. Fold out dining table accommodating up to 6 diners. Large luggage/utility room. 5 min walk to Andel, local shopping and business area with major supermarkets, shops, banks and services. Sweeping 180 degree river and monuments view from all front windows and balcony. Directly facing Vltava river, watch vintage ferries pass by from your own private balcony. Directly opposite Frank Gehry's 'Dancing house'. Spacious living room with two fold out sofas, dining table, original artwork,flat screen tv. Nescafe pod machine, Filter coffee machine and french press. Provisions can be provided prior to arrival at cost price. Please enquire about our grocery service. Brand new fully equipped kitchen, including a fully automated washer/dryer in one. Antique art deco fold out dining table, accomodates up to 6. Large balcony with sweeping views across the river and major monuments. Excellent location and view directly on the Moldau. In January it was nice and warm. Quiet environment. Owner quickly brought ice trays that were missing. Furnishings a mix of contemporary and period. Very high ceilings and nice lighting including beautiful crystal chandeliers. Don't take longish showers...we ran out of hot water the first morning. One strong recommendation for safety: put grab bars in the shower and provide a slip-proof mat in the tub. There is absolutely nothing to hold on to. We put a small towel in the tub to avoid slipping. Just great place to spend time in Prague. This place is everything you wish for. just for location and view. Το διαμερισμα ειναι αψογο απο καθε αποψη!!!!!!!!!! Το διαμερισμα ειναι στο δευτερο οροφο , με πανωραμικη θεα τον Μολδαβα , σε κομβικο σημειο να επισκευτεις ολα τα αξιοθεατρα της Πραγας. Απο εκει ολα μπορεις να τα κανεις με τα ποδια , Εαν θελεις να χρησιμοποιησεις δημοσιες συγκινωνιες ( τραμ ή λεωφοριο ) , οι στασεις απεχουν μολις δυο λεπτα. ( μην νοικιασετε αμαξι στη Πραγα , δεν ειναι απαραιτητο ειδικα εαν μεινετε στο παρων διαμερισμα ). Εμεις πηραμε μαζι και τα δυο πιτσιρικια . Το διαμερισμα ειναι τελειο να φιλοξενησει οικογενεια με παιδια. Η κουζινα εχει τα παντα, ζεστο νερο χρησης απεριοριστο , αυτονομη κεντρικη θερμανση, ανσασερ , Wi-Fi .........ολα τελεια!. Οι οικοδεσποτες , Karel και Gino , τρομερα φιλοξενοι , επικοινωνεις μαζι τους ανα πασα στιγμη , παντα προθυμοι να απαντησουν σε οποιαδηποτε απορια. thank you Karel and Gino!!!! !, everything was perfect we will visit you in the future , again. This is a very large apartment that is professionally managed, so don't expect a lot of individualized, personal hand-holding or personal interaction. Communication was good before our stay. We were met at the apartment by a house-keeper that showed us around the apartment. The apartment was certainly not spotless, but was clean enough. It was not very well stocked. For example there was not even a bread knife. However we made do. We made good use of the provided dish washer and clothes washer. The location is perfect if you use the public transportation. It is close enough to the main tourist attractions but far enough away as to be calmer than the tourist areas. Plus, there are some excellent restaurants very close to the apartment in a very nice neighborhood. Even though it was on a main street with considerable traffic, it was relatively quiet with the double doors closed. In the summer when it was hot, the noise versus ventilation might be an issue. There were instructions not to adjust the thermostats or else dire consequences. That turned out to work out OK, but it certainly would have been nice to adjust the temperature. That is one of the advantages of an apartment rental over a hotel room. The space is big with high ceilings, which we enjoyed, although it did feel a bit cavernous. Overall, we enjoyed our stay and would stay there again. 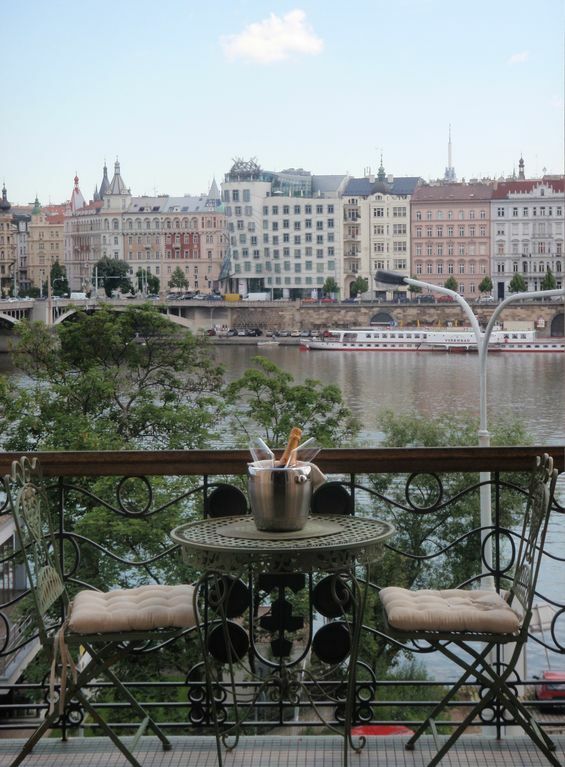 One of the best views in Prague, directly on the riverfront. 15 min walk from King Charles Bridge .Located on the border of Mala Strana (Lesser town) and historic Smichov. In a residential area surrounded by stunning art nouveau buildings. Within walking distance to most major sights - Lesser town, New town, Old town etc...With shops and services within 5 min walk. Andel, a major transportation hub with metro, tram and bus lines also within 5 min walk. Nearest tram station with several lines to all areas of Prague just 300 metres/4minute walk away. CHECK IN: 2 - 6 PM CHECK OUT 8 - 10AM late check in possible up to 8 PM, 20 EUR late check in fee applies after 6 PM with prior arrangements. EUR 50 fee applicable to late check ins in excess of 1 hr delay. Check in cannot be guaranteed if delayed more than 2 hrs. Check in time to be advised no less than 3 days prior to arrival. Rental balance including security deposit must be received no later than 7 days prior to arrival in cleared funds.Security damage bond EUR 300. Payable via Paypal 7 days prior to check in, refunded within 48 hrs of departure subject to final inspection of the property. Property is strictly non smoking with the exeption of balcony. No parties policy endorsed. We kindly aks our guests to respect the privacy and the right of quiet enjoyement of our co-owners' properties and to kindly refrain from producing excessive noise within 10pm to 9 am daily.